Your garage door makes up a large part of your home's overall curb appeal, as well as serves as a shelter for your car. Seeing as this type of system is used at least twice a day on average, when it experiences a malfunction, either due to the accumulation of wear and tear or from an unexpected accident, your daily routine will be greatly disrupted. There are several factors that will increase the costs of garage door repairs, and in order to keep your spendings minimal, you should understand what those are and what you can do to reduce them. When it comes to damage, the main thing that homeowners tend to be concerned with is not necessarily the cause but the cost. This is determined by the level of sustained damage and the complexity of fixing it. If only a small part of the door or its related components is involved, the repair will be cheaper compared to work that involves several parts. The skill level necessary to fix the problem, as well as the time it will take, will also affect the overall costs. For example, a problem with the opener motor will likely be more expensive than, say, an issue with the tracks or the rollers. The overall design and style of your door is also a very good indicator as to the price range of the repairs that will be required. 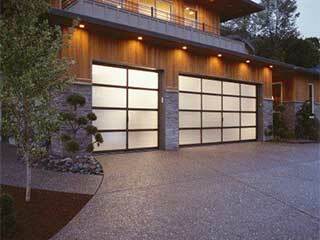 A standard panel replacement will be much cheaper compared to customized panels and doors. This difference in cost is related to the availability of the component in question, and the higher costs involved in obtaining more special or custom parts. Obviously, the repair costs will be much higher with more high quality products since the replacement parts for them will also be of a superior quality compared to other alternatives. A Genie or LiftMaster garage door opener, for example, will consist of higher quality parts compared to a no-name brand. The same is true when it comes to the panels. An aluminum panel is likely going to cost less than a wooden one. The benefit of going with leading brands, however, is that the frequency of repairs will be far lower, and the reliability of the product in question, whether if it's a Chamberlain opener or a Clopay garage door, will be far superior. In some scenarios, replacing the part in question will be actually cheaper than repairing it, especially in the long run. Our team at Garage Door Repair Carlsbad does everything possible to make our services as affordable as they can be, without compromising the quality of our work in the process. Give us a call if you want an effective solution to any overhead door related problem you may have.